It is really ironic that I try to discourage sweets but I have always have so much fun making them! I had the best time last Christmas making gingerbread men with my kids. My favorite part of every Thanksgiving meal for me is baking all the pies. 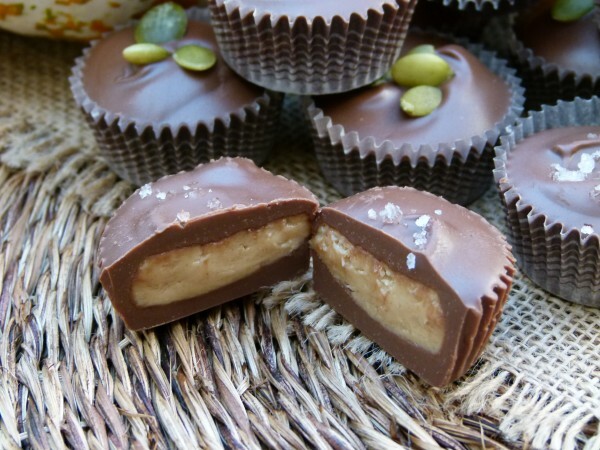 And more recently, I thoroughly enjoyed making these chocolate peanut butter and almond butter cups. 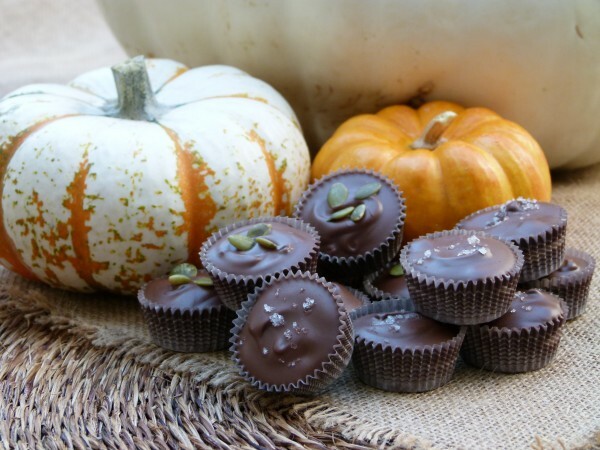 After my friend Rachel Sarnoff from MommyGreenest guest posted here about choosing higher quality Halloween candy, I did a little research looking for the best options (organic, non-GMO, free of artificial colors, etc.) And then I thought it might be cool to make my own candy for when I have guests over or to give as a hostess gift. 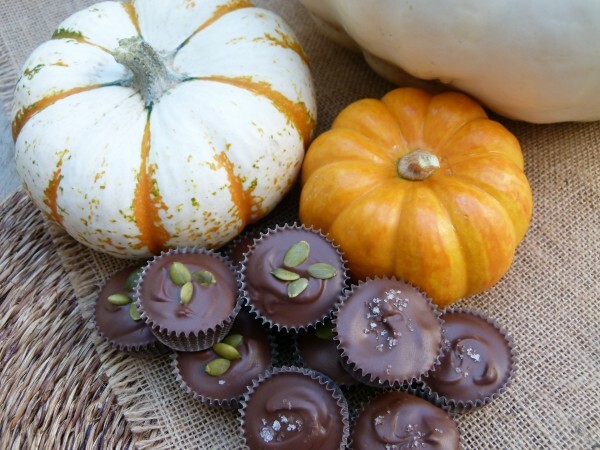 Do not for a minute think I would ever make my own Halloween candy to give out to trick-or-treaters! That would for sure put me over the edge. If you do that, however, I think you are amazing. Even better, I made these when I wasn’t in a rush. I wasn’t trying to beat the sunset so I would still have natural light for photographing. I wasn’t making these at dinnertime when I had other things to tend to. In fact, my son was sitting at the kitchen table doing his homework, quiet as a mouse, and my girls were out at their activities. And I found making these chocolates to be almost meditative. I can’t wait to make them again!! In fact, if you invite me over for dinner, I will likely bring you a little box of these! I know that some of you are ready to point out to me that these candies, no matter how much love and organic ingredients go into them, are not healthful. And you know what? You are totally right. I am not going to sell these to you today as something that’s going to save your life. Are they less bad for you than Reese’s? I can argue that yes, they are probably less bad for you than Reese’s which contains GMO-sugar, non-organic peanuts and TBHQ, a toxic preservative which is a derivative of butane. Nope, no butane in mine, but also not exactly health food. But it is Halloween and I think we’re entitled to a few treats now and then and that’s that. I have already made these several times, with both dark chocolate (less sugar) and milk chocolate. I have used (homemade) almond butter as well as organic peanut butter. And I have sweetened the filling with powdered sugar and also with a combination of powdered sugar and honey or maple syrup. Clearly the least bad (I know that’s grammatically incorrect) option would be dark chocolate with almond butter mixed with powdered sugar and maple syrup. And those are so delicious I can’t even believe it. But if you are looking to make something closer to a Reese’s peanut butter cup, then you need to use milk chocolate, peanut butter and all powdered sugar. Those were my kids’ favorites and I have to say they taste better than the real thing! If you’re looking for a fun activity to do with your kids or grandkids, look no further! Line a mini muffin tin with paper liners. If you are using a silicone muffin pan, it's probably a good idea to place the pan on a baking sheet so you can transfer it more easily to the refrigerator. Bring a small pot of water to a boil. Break up the chocolate into small pieces and place in a glass bowl big enough to fit over the pot of boiling water without touching the water (this is a double boiler). Lower heat so that the water just simmers and place the bowl of chocolate on top of the pot. Melt the chocolate, stirring occasionally, until perfectly smooth. Set bowl aside. Mix the almond or peanut butter, powdered sugar, vanilla and salt together in a small bowl until smooth. This mixture should be a consistency that allows you to roll it into small balls. Spoon a teaspoonful of chocolate into each lined cup. 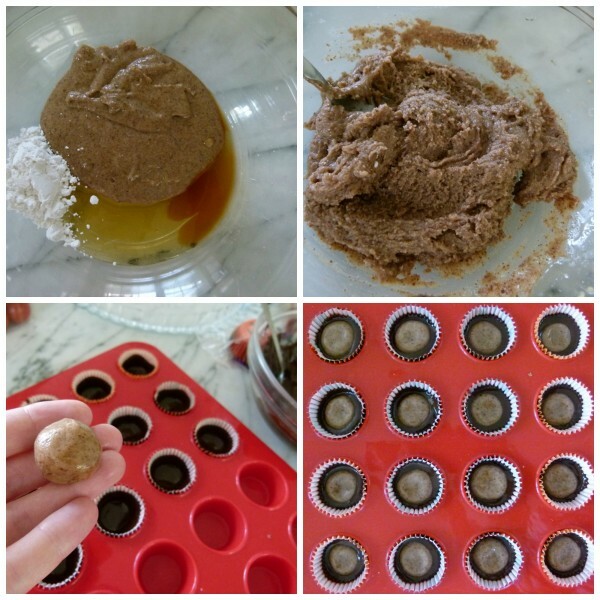 Scoop a teaspoon of the almond/peanut butter mixture and roll into a ball with your hands and press down slightly to flatten a little. 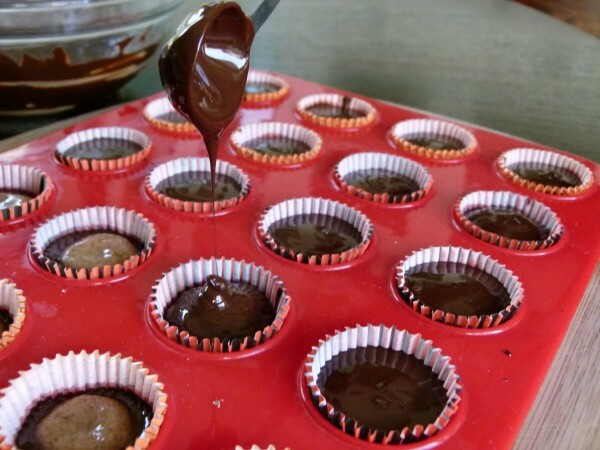 Place in the center of each chocolate cup and push down slightly to allow the chocolate to cover the sides, but not the top of the almond/peanut butter disc. Pour another teaspoon of chocolate on top of the cups covering the peanut/almond butter mixture completely. Use the back of your teaspoon to smooth out the chocolate on the tops of each cup. Sprinkle with a pinch of sea salt or a couple pumpkin seeds if you like and place in the refrigerator for a few hours to harden. If you need to speed this up, place in the freezer. Because the chocolate is not tempered, you should keep these refrigerated. I use this silicone mini muffin pan. Each individual mold measures 1½ inches across the top. I found two mini baking liners at Michaels which worked perfectly, but these were just slightly too big for my pan. Try refrigerating the peanut butter mixture first. But it’s not super important for it to be totally firm. A little soft is ok. Just drop a little onto the chocolate! I’d like to make these today. 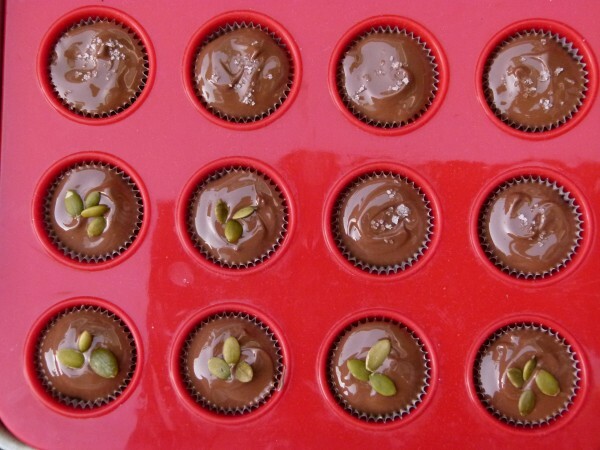 Can I possibly use already packaged melted unsweetened chocolate for these Peanut cups??? I know I will need to add sugar of course , but will the melted chocolate packets harden up after they are assembled? I have a bunch of this type of unsweetened chocolate that I’d love to use up??!! Thanks for any help….Merry Christmas! Merry Christmas to you too, Tracey! I have never used packaged melted chocolate before, but my gut tells me that if it’s already melted and stays that way at room temp, adding sugar isn’t going to change that. I suppose you can try placing a small amount in the refrigerator and if it hardens up in there, you can make the candies and then make sure you store them in the fridge. You should probably read the package to see how you would go about adding sugar to the melted chocolate and how much. Cheers! Hey Pamela…Happy New Year! Thanks for the reply about the melted chocolate …your thoughts were mine exactly! Didn’t get a chance to do them before Christmas but I still will try it…I’ll let you know how they turn out..YUM! Thanks! Sounds good! Happy new year to you, too! We give these as Holiday teacher gifts and they are always much loved. We are wanting to bake in advance this year. How long do you think they will last in the refrigerator? Do you think your chewy molassses-ginger cookies would keep in the refrigerator too? Or would you live them room temp in an airtight container? I think they will last a week just fine. I would make the cookies a day ahead if possible but I have never tried keeping them in the fridge so I can’t guess how they would stay. Lucky teachers! Thanks for the great photos attached to your post. I have been making my own version of these for a couple weeks but I am so much messier than you! 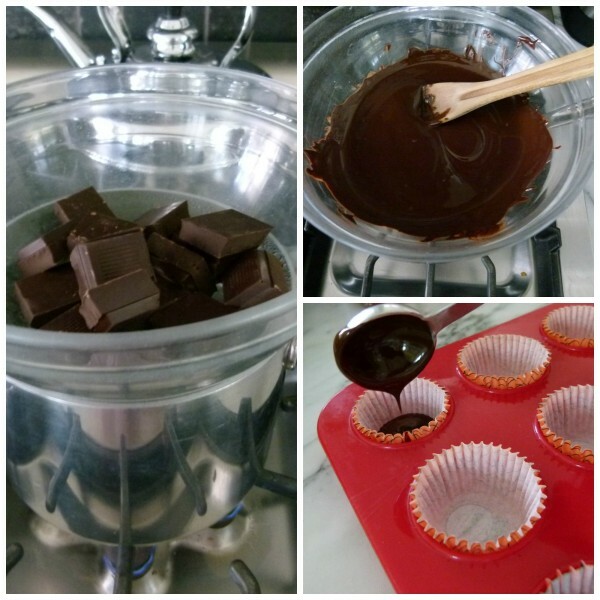 It looks like you are using a metal measuring teaspoon to drop the chocolate…true? Also, it looks like you are adding the nut butter while the chocolate is still melted… also true? I’ve followed several recipes all suggesting to freeze the chocolate in between. I like your end result, so would love any of your tips! Thanks! Hi Amanda! Metal measuring spoon — true! Adding nut butter while chocolate is still in a melted state — also true! I find no benefit to freezing the chocolate before adding the nut butter. Just press it in gently. I think the method I gave here is the easiest with just as good results. Just read some of the other comments people left about keeping the chocolate clean, etc. Enjoy! These totally rock! I love making them, it does not take too long to whip them up. I made one batch and cheered up a friend, thanked a teacher, and brought the rest as a hostess gift. So loving these! Easy and fun. thank you. Aren’t you sweet! I agree, these are easy and very fun to make. They would be great to give for the holidays! These look absolutely delicious I really want to try to make them! Any idea where I may find a tray like that in NYC? Also, which dark chocolate did you use here? Thank you!!!! Perhaps call Sur La Table and see if they have it. I think I used Black & Green’s dark chocolate in these images. So easy! My two sons and I made these in about 20 minutes. They aren’t as pretty as yours but I’m sure they will taste great. I just tried them. They are amazing! So much better than Reese’s peanut butter cups. I agree! They’re much fresher tasting then Reese’s! Thanks so much, Lynette for commenting. OMG! I will be making these asap! Love you! Help! Made these tonight… Super yummy, Had trouble melting my Guittard milk chocolate, so moved on to 62% chocolate which worked fine. What could have gone wrong? What kind of milk chocolate do you use? 62% is still pretty sweet. You haven’t gone dark yet. What do you mean you had trouble melting the chocolate? It took a long time? I’ve never had difficulty unless something mistakenly got added to the chocolate, like cold milk or a drop of water for example. Perhaps your chocolate was not broken into small enough pieces?? Or did you overheat the chocolate? Remember the bowl should not touch the water. I have used several different brands with success — Black and Green’s, Theo, Trader Joe’s, Valrhona. Yep. That’s what happens. Bummer. Now you know.